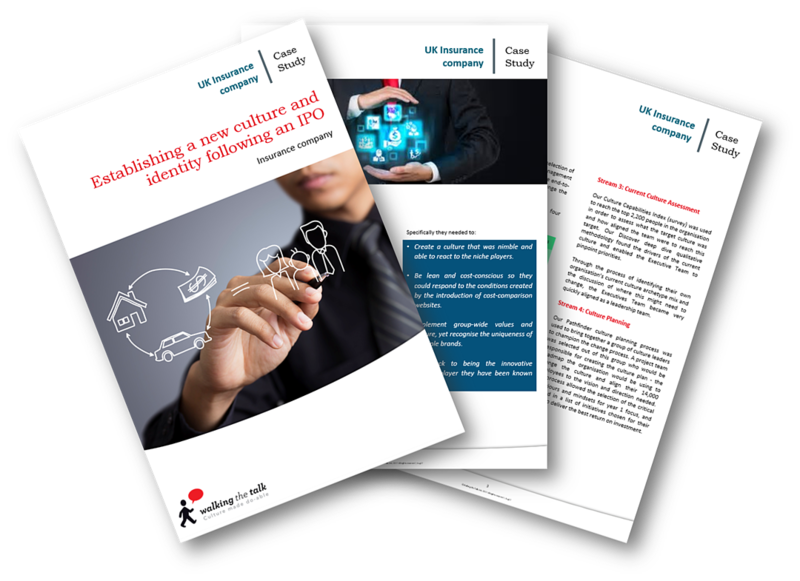 Thank your for you interest in our UK Insurance Company Case Study - Establishing a new culture and identity following an IPO. To download just complete and submit the form. UK Insurance was established in the late 1980s, and known as one of the UK’s leading insurance companies which specialise in selling insurance and other financial services directly to consumers through a variety of channels. With just under 14,000 employees and a presence in the UK, Italy and Germany, the organisation owns several of the region’s most recognisable insurance brands. Emerging from a robust history as pioneers of direct motor insurance and telephone insurance sales, the organisation divested from its parent group and successfully completed an IPO.